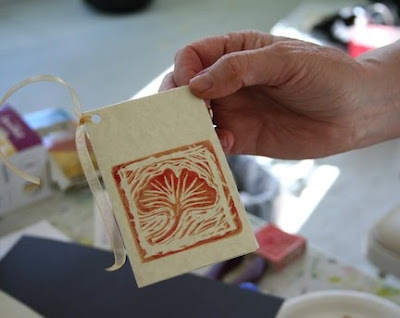 The soft block printing workshop was so much fun – it's an enjoyable process! Taking two days for it allowed us to spend the second day printing, while we needed much of the first day for carving the blocks and making test prints as we developed them. 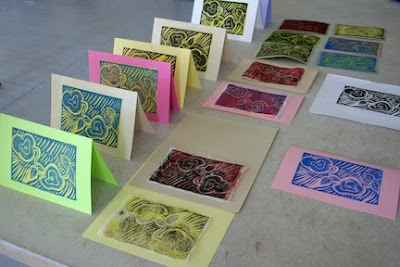 We used various methods of printing multiple colors. These photos were all taken on the second day, so I'm sorry to say I don't have any of Connie, who was with us on Saturday. 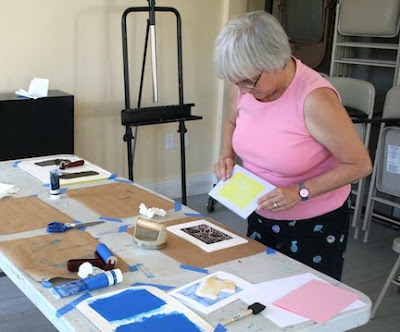 Here you can see Carolynne's printing in progress. 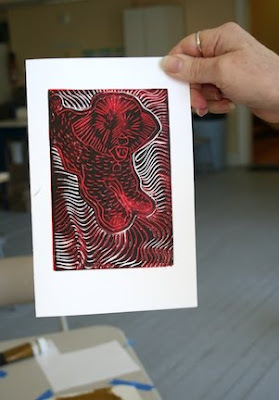 This was the second color of her print. 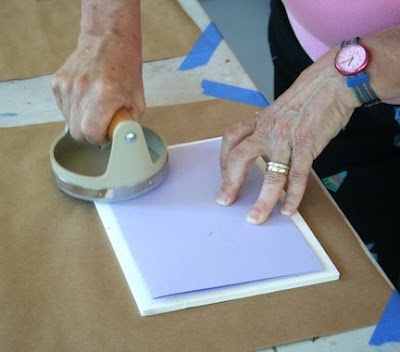 The first run was of yellow, striking against the lavender color of the paper. 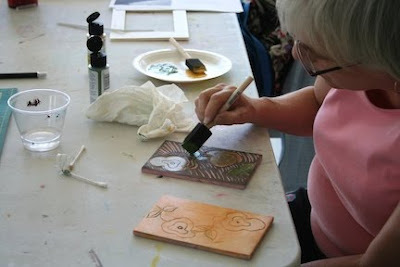 Carolynne was making a series of printed cards. This method works beautifully for hand-printed cards. This printing process was a reduction cut - with further printings from the same block, which you continue to cut more of. The tricky part is that you can't go back to print more of the first run, once you've cut the block further. You have to really plan in advance. Notice the two blocks? 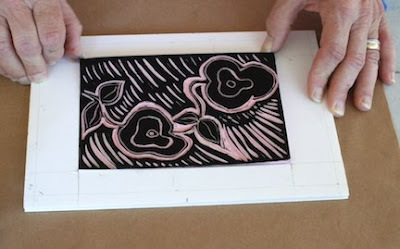 Here you see a second block, using the same design, created from the first, as well as the first block (with its reduction cut), which is being hand colored. 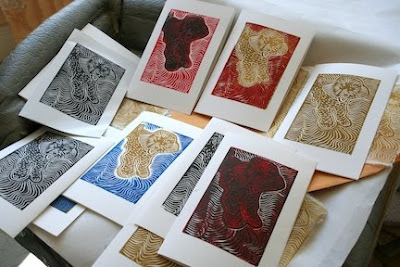 Here are some of Carolynne's prints, including several on rice paper, which works beautifully for block printing. 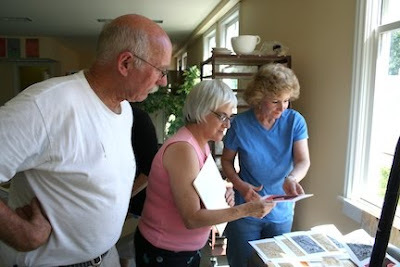 Everyone was pleased with the results they got from printing on rice paper. 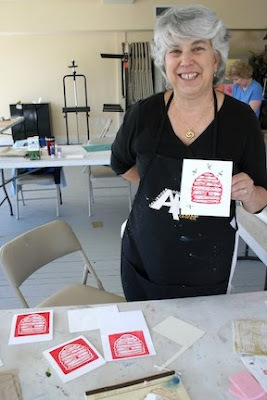 Donna experimented with different ways of combining different blocks or parts of blocks in the same print. 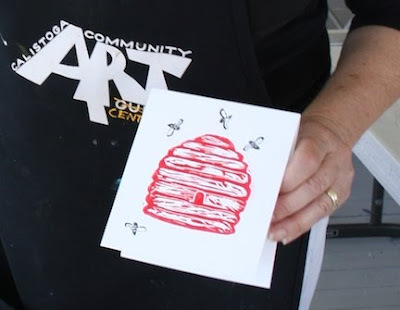 She asked herself, what would the hive be like both with and without a background? And what would it be like with bees? 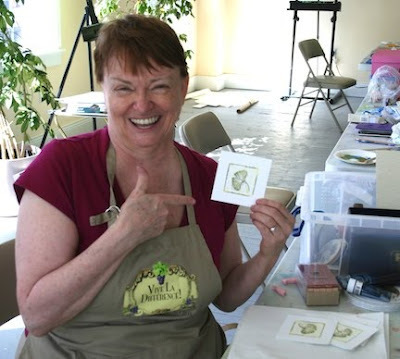 You can see both the cards Donna created from her Isis block and her Isis and beehive blocks. 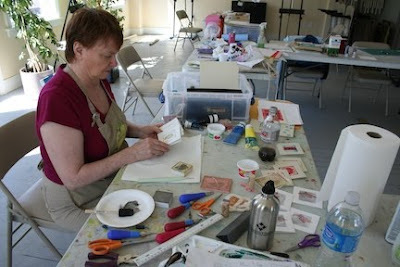 You can see some of the tools we used in the course of creation during the weekend, in the array Betsy is working with at her table. Betsy used several small blocks to create sets of gift tags, using different combinations of colors and different methods of creating multiple colors. Here is one of her wonderful gingko leaves. The subtlety of this hand-applied second color adds a richness to the print. Red and copper make a beautiful combination. 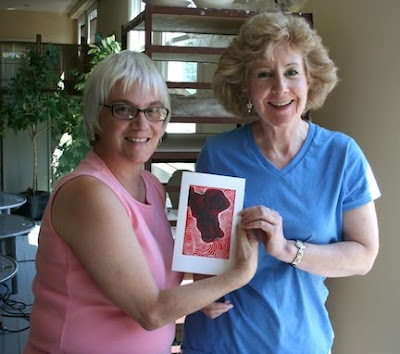 Jane created a series of prints of Max, her dog, using different combinations of red, black, blue, and gold, with white paper. 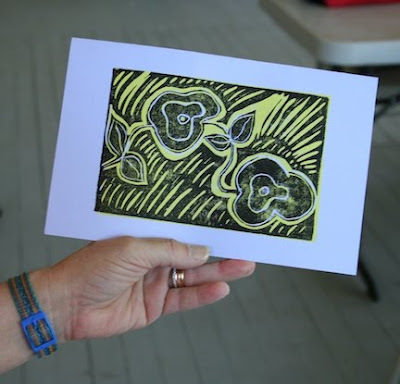 The liveliness of her carving makes for a fun print. We realized, looking at everyone's results, that sometimes when the registration of the second color is a little bit off, it creates some nice special effects with the paper. Happy accidents! Look at the variety of possibilities! Again, these were all printed from one block. 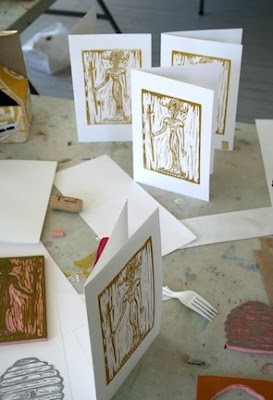 This second day of printmaking was a wonderful exploration of possibilities. What a joy! 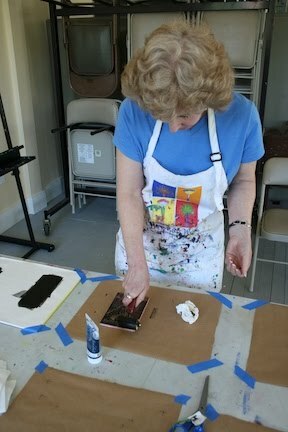 That's what soft block printing is all about, for me. 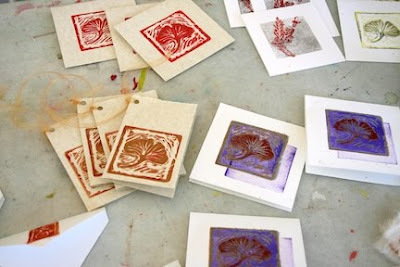 I'm tentatively scheduling one more Soft Block Printing workshop for the year, in October, for those who would like to learn the process and create cards or prints for the holidays. I'll post the date and time when it is definitely scheduled.